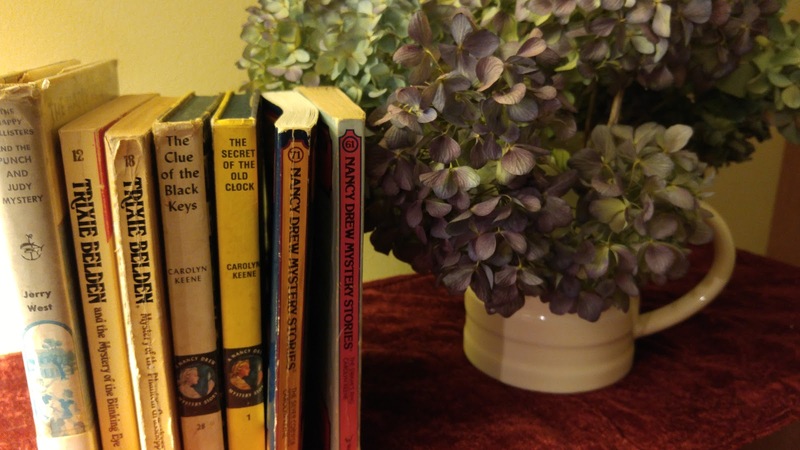 Did you read Nancy Drew when you were a kid? I did, constantly. My best friend and I would pass them back and forth and discuss them endlessly. I knew they weren't great literature but oh, they were fun! Nancy and her friends George and Bess were always involved in some huge adventure. They would go racing off in Nancy's blue convertible and save the day, because Nancy always knew what to do and always was able to do it. Everyone deferred to her, she had everything. She was pretty and smart, and well-off and again, she had that blue convertible-yes, I wanted it. I still kind of do. I knew the books were ridiculous. I knew no one would ever run into that many adventures and always come out the winner. I knew even at the time that the books were pure escapism, but I didn't care. I thought Nancy Drew was wonderful. Nancy was strong. She was independent. She stood up to people and stated her opinion. She could fix a car, solve a puzzle, do any sport that was suggested, run a house, I think she could shoot a gun. Basically there wasn't anything she couldn't do. She was also very likable. She didn't gloat when she did all these things. She was modest and humble and respectful. And pretty, let's not forget pretty. Plus she only had an adoring father which basically meant no one telling her what to do. There was the dream life right there. I think I admired her independence. She wasn't a shrinking violet. She went out and did what needed to be done and spoke up for herself and others. She was a strong independent woman (girl actually, but when I was 10 I thought she was a woman.) She didn't need to be rescued, she did the rescuing. What is not to love? I think I still want to be Nancy Drew. On a related note, did anyone grow up reading The Happy Hollisters? We had the whole series when I was a child. A family of five children who were also always solving mysteries. Mrs. Hollister always calmly waved them off to chase the bad guy with only an admonition to not be late for dinner. Sometimes they had to leave Sue, the four-year-old, home because she might miss her nap but otherwise Mrs. Hollister never worried. And the children always returned having vanquished the criminal, solved the mystery, and been lauded by all. And then there was Trixie Belden. I loved those too. Another group of kids solving mysteries. No wonder that when I was small I thought being a detective was a feasible career choice. Practically every book I read had kids running into mysteries at every turn. My prosaic life was a sad disappointment. I think there was a definite theme to children's books back then. Get rid of the parents and allow the kids to be independent. It fits into every kid's dream. I read a lot of Nancy Drew too - I think I had all the books in the series at one point. I liked them and re-read them often, but not as obsessively as the Little House books, or Louisa May Alcott. My sister got the Trixie Belden books (and also the Bobbsey Twins). I liked those better, I think because they were more realistic. I wanted to be friends with Trixie & Honey! I think I probably got hooked on mysteries through these books, and also long series with continuing characters. I think The Little House books and Little Women were true favorite books, while Nancy Drew and Trixie Belden were just fun things to read. Maybe the children's version of chick lit? Light and fluffy and you had to suspend all belief. I wanted to be friends with Trixie and Honey too, though! I love Trixie Belden and the Hardy Boys and Nancy Drew and the Happy Hollisters! Oh, and the Bobbsey Twins.